AdGreetz today announced the launch of AdChef, its new proprietary, fully-automated and integrated marketing platform. AdChef is the world's first personalized video/display platform able to produce, upload and deploy millions of unique creative versions of ads to the most popular digital media platforms and demand side platforms (DSPs), while concurrently optimizing via AI/machine learning all in real time. It can be integrated for use with platforms, including: Facebook, Instagram, Twitter, The Trade Desk and Google's YouTube, AdWords, DoubleClick, among others. AdChef is now patent pending with the U.S. Patent and Trademark Office (U.S. Patent No. 62/790,274), and the corresponding office in India (Patent No. 201914004174). "AdChef represents the next generation in digital advertising, media buying and dynamic creative production and optimization," says Eric Frankel, CEO and Founder of AdGreetz. "Historically, brands and their agencies produce a single, generic, one-size-fits-all commercial and deploy to each digital media platform/DSP on an individual basis. For the first time in digital advertising, brands, agencies and media buying firms can produce and deploy millions of hyper-personalized ads and simultaneously optimize their performance across dozens of the most popular digital media platforms/DSPs." Kunal Dubey, Director of Marketing for Flipkart, India's number one e-commerce site and AdChef user said, "AdChef represents a dramatic shift for the advertising industry and has improved the way Flipkart communicates with customers in a personalized manner. In our partnership of two years, we have been able to upgrade our one size fits all ads to dynamically created and optimized ads across digital platforms. For Big Billion Days 2018, AdChef was critical in scaling up our marketing by creating 3 million-plus videos and improving performance metrics across digital channels." 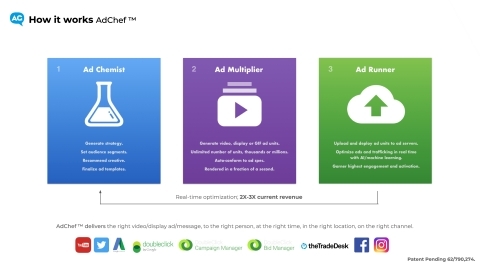 AdGreetz' AdChef increases activation(revenue) two to three times and saves significant media costs by delivering the right video/display ad/message, to the right person, at the right time, in the right location, on the right channel and in the right format. AdGreetz is the leading proprietary SaaS video personalization platform that empowers brands worldwide to build stronger relationships with individual consumers, drive revenue and accelerate their digital transformation by allowing them to converse with customers on an individual level via millions of hyper-personalized, "smart", data-driven, video messages and ads (on 21 digital and traditional channels) that engage and activate 2X-3X better than other marketing tactics. Channels include: Facebook, Instagram, Google Marketing Platform, YouTube, Twitter, display, email, premium video, print, outdoor, point of purchase, apps, on-pack, OTT, Snapchat and website.